The page layout is set for Avery #5160 or #5260. Copy-n-Paste from the server screen to your own PC screen should be working ok.
Click the “Local Resources” tab. Near the bottom, make sure “Printers” is NOT checked. Make sure “Clipboard” IS checked. Nothing should be checked except for the C: drive. You’re done! Either click “Connect” or close that window. If you are doing a Preview of a report and it looks really weird (no formatting, spaces between characters), move the MemInfo window to the side, double-click the Printers icon on the desktop (not within the MemInfo window), and make sure that “Bullzip PDF Printer is check-marked. (No other printers should be there. If they are, you should delete them. Hopefully, that will do the job. 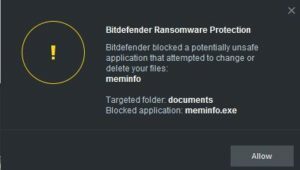 You might see this message if you have been connected to MemInfo but have not used it for several hours. It logs you off. (Not a very appropriate message, huh?) So, simply reconnect. This is normal. Simply check the box that says “Don’t ask me again…” and click the “Yes” button. This error is caused by something happening in your computer, not in the Server. Don’t worry; it’s simple. The problem is related to Internet access. If you get this message, please disconnect from the server (you don’t have to “log off”; just click the “x” on the blue bar), then connect back on. Nothing will be lost; MemInfo will be sitting there ready for you to continue. On your own computer, go into Start | Control Panel | Device Manager … click on “Network adapters”, right-click on each of the adapters, then properties. If there is a tab named “Power management”, make sure the option for “Allow the computer to turn off this device is not checked. Start | Control Panel | Power Options … For whichever plan you have chosen, click on “Change plan settings.” Then click “Change advanced power settings.” for “Wireless Adapter” or any other entry that sounds like it might have something to do with networking, under its “Power Saving Mode” click a setting that does not save power. Also, please send an email to 911 at meminfo.com with the Remote Desktop number (xxxxxx-x) and the time of day when it happened. We are trying to track this error in hopes of finding a permanent fix. When previewing a report, please do not click the printer icon from that menu. There is no guarantee where the output will go. Instead, you should choose “Go” or “Output” or “Print” on the previous screen. 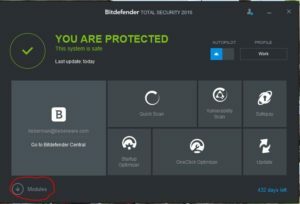 (1) Start BitDefender and click “Modules” in the lower left-hand corner. 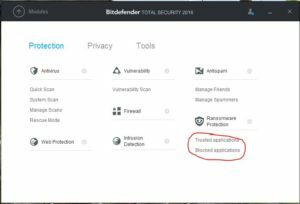 Choose “Blocked applications” in the lower right-hand corner. Then re-start MemInfo. That should take care of it. There is an option on the Statements screen that says “Skip families who have email.” If you select this, then you can run through the statements again, just processing those families who do not have email addresses. 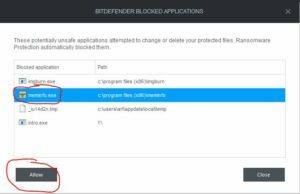 (2) If you are doing a Preview of a report and it looks really weird (no formatting, spaces between characters), move the MemInfo window to the side, double-click the Printers icon on the home screen, and make sure that “Bullzip PDF Printer is check-marked. (No other printers should be there. If they are, you should delete them. Hopefully, that will do the job. 911 at meminfo.com and we’ll fix it as soon as we can. Click your “Start” button(lower-left corner of your screen) and type “remote desktop connection”. Wait until it’s found and then click it. Left-click on “show options” in the Remote Desktop window. Near the bottom, make sure “Printers” is checked. If the “C:” drive is not checked, that’s the problem. (1) It sat idle for a couple of hours. If you aren’t using it, it can go away. 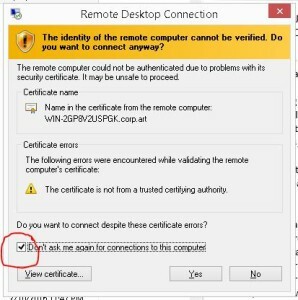 (2) Someone else connected in using the same Remote Desktop .RDP number (xxxxxx-x). Different people and/or different computers should use different .RDP (icon) numbers. Refer to “setting up remote desktop“. You should not receive this message. But if you do, contact MemInfo Support before doing the steps, below. Make sure you have Remote Desktop version 6 or later. Click (highlight) on “My Computer” at the top of the list. Use Windows Explorer to verify that the file is between 100 and 200 MB. Modify the key named ‘Security Packages’ to add ‘tspkg’ to the listing of security packages. Do not remove any packages. Modify the key named ‘SecurityProviders’ to add ‘credssp.dll’ to the listing of Security Providers.